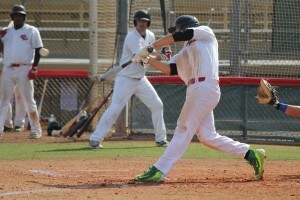 PALM SPRINGS, Calif. – Fans were treated to a thrilling finish in game one of two at Palm Springs Stadium on Saturday, as the Palm Springs Power scored the winning run on a pickoff attempt to defeat the Toronto Rush, 7-6. With runners at the corners and one out in the bottom of the seventh, Christian Lyman left early from first base and was caught in a run down. As right-hander Matthew Dallas threw to the covering short stop Chris Amato, Hayden Mahe-Liessman sprinted and scored from third base to give the Power a walk off victory. The Power got off to an inauspicious start in the first inning, as the Rush sent eight men to the plate and scored two runs. Chris Amato scored on a Raul Shah RBI single, and Shah ultimately scored on a bases loaded walk by Mason Schoettlin. The Power answered with two of their own in the bottom half. Jake Willsey smacked a long home run to left field to cut the deficit to 2-1. Two pitches later, Stefano Belmonte went deep to left-center to tie the game at two. In the second, Toronto regained the lead with Cameron Franklin scoring on an error. One batter later, Robert de Angelis doubled home Amato to give the Rush a 4-2 advantage. De Angelis extended the Toronto lead to 5-2 with a massive home run to right field. However, the Rush lead was short lived, as the power pushed across three runs to tie the game in the bottom of the fourth. With the Power leading 6-5 in the seventh, Shah reached base on a two-out error to keep the game alive for Toronto. After a Hector Marmol single, Schoettlin singled in Shah to nod it up at six. Needing a rally in the final Palm Springs at-bats, Mahe-Liessman doubled and stole third base with one out. He then slid safely ahead of the throw to give the Power the dramatic win on the 1-6-2 pickoff play. Tyler Sharp got the win, but was tacked with a blown save. Dallas was handed the loss. Game two featured a dominating performance by the Manitoba North Stars over the Coachella Valley Snowbirds. Gary Aho, Nicholas Laurence and David Meade allowed just three hits over a combined seven shutout innings in the 6-0 win. Will Krug had a career day, as the speedy centerfielder went 4-4 with a triple, two RBIs and three stolen bases. Cory Slater launched a two-run home run in the fifth inning to effectively put the Snowbirds away. Aho got the win after allowing no runs on two hits, five walks and two strikeouts over four innings of work. Keita Shimizu took the loss for Coachella Valley. Sunday, January 28 is “Super Lotto Sunday” at Palm Springs Stadium. The first 100 fans who purchase a ticket will be awarded a California Super Lotto ticket upon entry. Game one between the Toronto Rush and Coachella Valley Snowbirds begins at 10:00 am. The broadcast can be listened to live at CaliforniaWinterLeague.com.